Summer in Australia can be hot. As the weather is warm, my favourite thing to eat is ice cream. I honestly love ice cream. And I am obsessed with ice pop moulds, I have so many different shapes and sizes and each time I see new ones, I have to buy them. This recipe comes with two flavours passionfruit and lime. Now I truly love the passionfruit one, it is my favourite. The lime is lovely also and I always make both, but the lime is slightly tarter, so taste before freezing them and add more sugar if needed. Quite often I make faces when I eat the lime ones, as the limes were particularly tart. This is something I love, my kids love them to, they just don't like the addition of the desiccated coconut in the ice cream part, so be warned, kids may not like the bits in it. Now I still add the desiccated coconut as that means they won't touch 'my' ice cream, but every now and then I'll make a batch without the desiccated coconut, as they prefer these. Also with the fresh passionfruit, I use fresh mostly, especially when in season, but I have at times used passionfruit pulp in a tin as it was in my pantry. It is slightly sweeter, but tastes great anyway. If you don't have ice pop moulds, feel free to use 10 plastic cups instead and just insert paddle pop sticks in after you have frozen the ice cream for about 30 minutes, that way they will stay in the position you put them in. To remove them out of plastic cups just squeeze the cups gently, they should pop out. You can also place the cups in warm water if needed, just don't let the water get into the ice cream. So here you have two ice pop flavours that will taste fresh and let you get through the summer heat. Combine 1/2 cup of lime juice (or passionfruit juice) and the caster sugar in a small saucepan over low heat. Stir for 3-5 minutes, until the sugar has dissolved. Pour into a jug and add the pineapple juice. Allow to cool for 20 minutes. Add the yoghurt, whisk until lump free and completely blended. 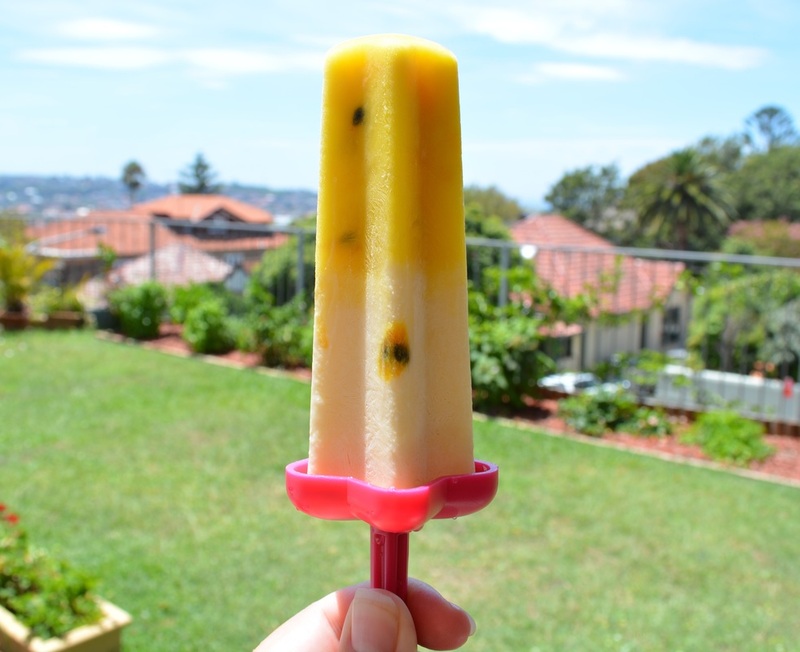 If you like to have a stronger colour add a few drops of green food colouring to the mixture for the lime ice pops or yellow food colouring for the passionfruit ice pops. This is completely optional. Pour into your mould, I like to go 1/3 of way up, but I honestly never measure. Cover with cling film and freeze for 2 hours or until firm. Spoon the ice cream into a large bowl, allow to stand for 10-15 minutes to soften slightly, don't allow it to melt too much. Add the coconut cream and desiccated coconut, gently stir it all together, trying to keep the mixture thick and creamy. Spoon the mixture on top of the lime (or passionfruit) mixture. Place on ice pop mould lids and freeze overnight. 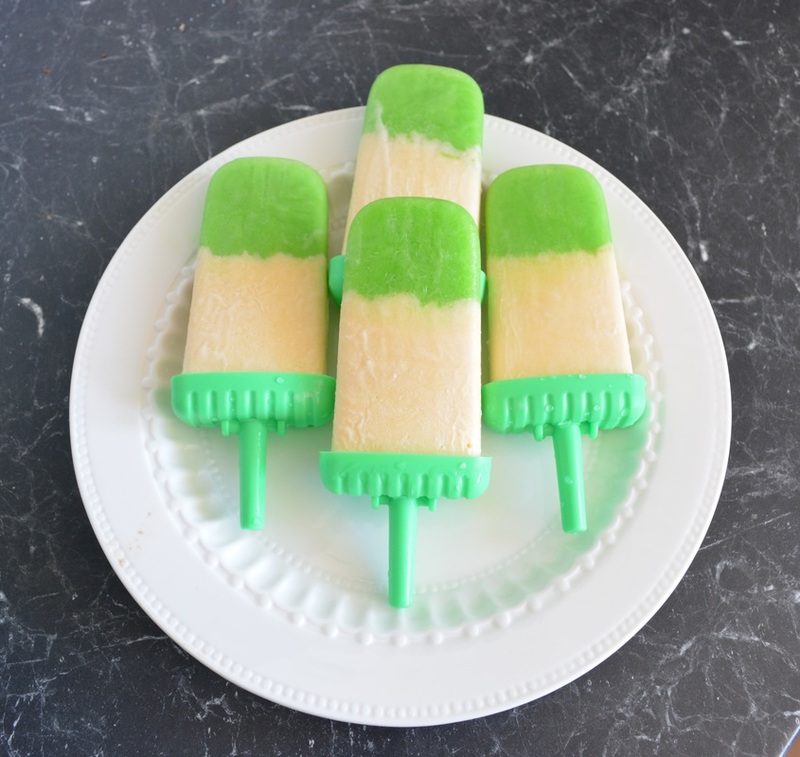 To serve, just run the ice pop mould under hot water and they will slide out. Serve immediately.